GREENHOUSES OF HOPE: Congregations Growing Young Leaders Who Will Change the World. Herndon, VA: Alban Institute, 2010. xvi + 231 pages. From where will the leaders of the church tomorrow emerge? More specifically, in what context will the gifts and callings to ministry of the church’s future leaders be nurtured? The answers will be found in local congregations, both large and small, where seeds of faith are planted and visions of service are nurtured. Although there are many cases of this happening without intentionality – with young people catch a vision and pursue a calling, even if the local congregation and its clergy are uninvolved and unaware of their callings – there will be greater benefits to the church and to the world at large if congregations intentionally commit themselves to discerning and supporting calls to ministry. These kinds of communities are, as the title of this book suggests, “greenhouses of hope.” These are places where young leaders emerge, desiring to join with God in changing the world. Dori Baker, the editor of this collection of essays, defines a “greenhouse of hope” as a “Christian congregation freeing itself to experiment with both newly imagined and time-honored ways of following the path of Jesus.” These congregations seek to “embrace the gifts of youth and young adults,” with the view toward young leaders emerging from their midst (p. 2). 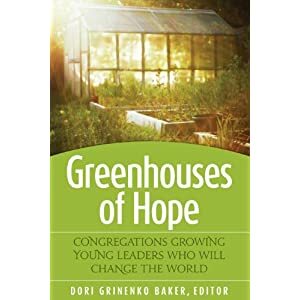 The book – Greenhouses of Hope – is the culmination of Baker’s quest to discover vital congregations committed to this cause of raising up the next generation of leaders. In the course of her studies of congregations she was looking for the diverse ways in which congregations take up this calling of nurturing a vision of ministry. What results from this work is a series of ethnographic studies, some of which Baker wrote, and some that other scholar/practitioners offered. What we see are “detailed observations of the ways of life of a particular people in order to learn about them, from them, and with them” (p. 3). Baker is a United Methodist who serves as scholar-in-residence to the Calling Congregations initiative of the Fund for Theological Education. The other contributors to the book are primarily United Methodist, but there are also Presbyterian and AME Zion representatives as well. These other contributors help provide a broader ethnographic picture of congregational practices that nurture faith and visions of service. What we see in these studies is the way in which mission trips, youth mentoring younger children, interfaith engagement, close community that provides a safe place for youth to ask questions and explore vocations, providing a strong sense of empowerment with accompanying opportunities to share in leadership in a particular cultural context (African American), and interestingly enough, even in the midst of conflict. What one finds in common to all of these communities is that they are with some degree of intentionality giving young people opportunities to take leadership, explore their gifts and callings, and affirming them in the process – even if the congregation itself is struggling with conflict. We want to see bright, creative, innovative young people answering a call to be pastors and preachers who will, in turn, help shape the imaginations and vocations of others. (p. 6). At the same time the authors of these studies were convinced that “Greenhouses of Hope” could and should nurture callings to purposeful lives among all the young people. That is, through their baptism, all Christians are called to lives of ministry. Therefore, the expectation is that the imaginations and callings of all the people would be stirred and nurtured, even if only some of this number answered the call to professional ministry. The belief is that “People formed by congregations that care about vocation learn to find ways that all of their work in the world can be connected to their call as Christians” (p. 7). In the opening chapter of the book, Baker explores the image of the greenhouse. The image emerged from a set of abandoned greenhouses that a neighborhood group purchased and renovated. These greenhouses had been built to house roses, but now the new owners pulled out the debris, put in new soil, and planted new flowers, fruits, and vegetables. One of the greenhouses was even renovated to raise a special rose that was found still living within the old greenhouse. What an image that is – something old and now wild was nurtured to health and productivity. There was, however, one greenhouse that didn’t get renovated. Roses still grew there, without fertilizer or care, its only nourishment being water seeping through cracks. These roses continued to grow, bursting through the ceiling of the old greenhouse. But, this happens in spite of many obstacles. And here is the metaphor, the image that drives the conversation. Baker writes that “God will call young lives, with or without the help of congregations.” God will not be left without a witness, but how much better it is when congregations cease being obstacles, and instead commit themselves to being places of nurture and hope, so that young people needn’t be “left to eke out their calling solo, but rather were given the best of their community’s resources of attention, love and nourishment toward their vocational flourishing?” (P. 11). And yes, even “old growth” churches, churches that have been around for generations can and should be places where this nurturing process takes place. Throughout the book, the authors align their observations around four practices, which carry the acronym CARE. Greenhouses of Hope “Create hospitable space to explore Christian Vocation; Ask self-awakening questions; Reflect theologically on self and community; and Explore, enact, and establish ministry opportunities (p. 30). Each of these practices is important and even essential to the effective nurturing of calls to service. Each of the chapters offers a look at a specific form of space or action, but one that I found especially intriguing, in large part because it’s culturally different, but maybe very culturally relevant for many of our smaller churches. Sinai Chung writes of a Korean Presbyterian Church that engages in what the author calls mozying. This practice is named after the Korean word for older siblings. The concept that has taken root in this particular congregation is that the older children/youth/young people help care for the younger ones. That is, the older ones mentor the younger ones. The need emerged from the transition from first to second generation Koreans, and the need to help second generation Koreans engage in congregational life. This practice is characterized by a belief in “intensive and genuine sibling love.” It is rooted in an intimacy between the younger and the older. Second, unlike most other mentoring relationships, both benefit. Finally, the practice is “highly contagious.” That is, it leads to chain reactions among all age groups. Although this particular practice has its own cultural roots, it has great potential as a model of making a space for ministry practice and spiritual growth. In her concluding essay, Melissa Wigington summarizes the various models that had been explored earlier, and offers important reflections. She warns, rightly against the tendency to tokenism – something that occurs in every church. We try to get young people on boards and committees, just to say we’ve done it, without any real thought about the spiritual welfare and development of these young people. She notes as well three common themes that emerge from these ethnographic studies – in each context intergenerational relationships are valued and nurtured, young adults and youth are given authentic roles in the life of the church, and present in each are “embodied spiritual practices that connect lived experience with the holy” (p. 195). The greenhouse is a safe place to grow and experience life in ministry, but as Wigington points out, eventually these plants have to take root outside the safety of the greenhouse. Issues such as delayed adulthood and the economic realities of the day affect the way in which young adults are able to navigate their world. They face the prospects of burnout, not being able to find themselves, and sometimes having too narrow a vision of the world, and thus feeling trapped by these commitments. What these greenhouses must do is help prepare young adults to be resourceful and open to new opportunities so that they can navigate the world that they inhabit. And their ability to do so will be rooted in those four practices that carry the acronym – CARE. This is a most helpful and encouraging book, especially for churches that are willing to embrace a call to nurture the ministry gifts of their children and young people. It is a good reminder that congregations can either be obstacles or encouragers. Each of the studies opens vistas that might prove helpful in a particular context. The chapter on churches in conflict allows us to see that even when churches are not healthy, they can still be places where callings are intentionally nurtured, even if difficult to maintain. Dori Baker is to be commended for drawing together a team that can provide Mainline churches seeds of hope for the future.